Schmidt, C.A. & Shattuck, S.O. 2014. 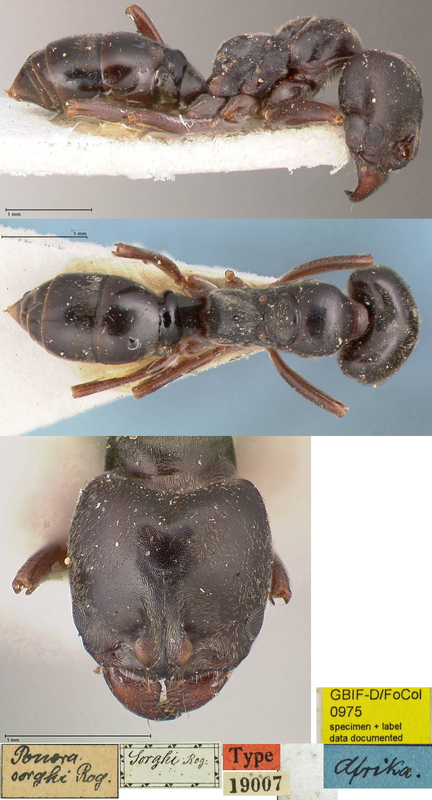 The Higher Classification of the Ant Subfamily Ponerinae (Hymenoptera: Formicidae), with a Review of Ponerine Ecology and Behavior. Zootaxa, 3817, 242 pp. 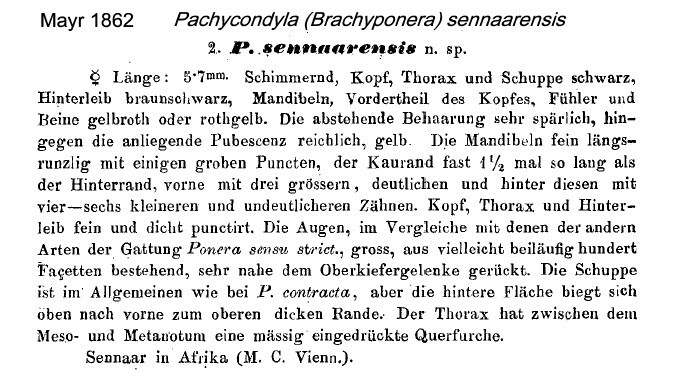 redressed the blanket lumping of genera and subgenera under Pachycondyla. In general, I welcome their reclassification as redressing the post Bolton/Brown situation, which was accepted without any argued basis. 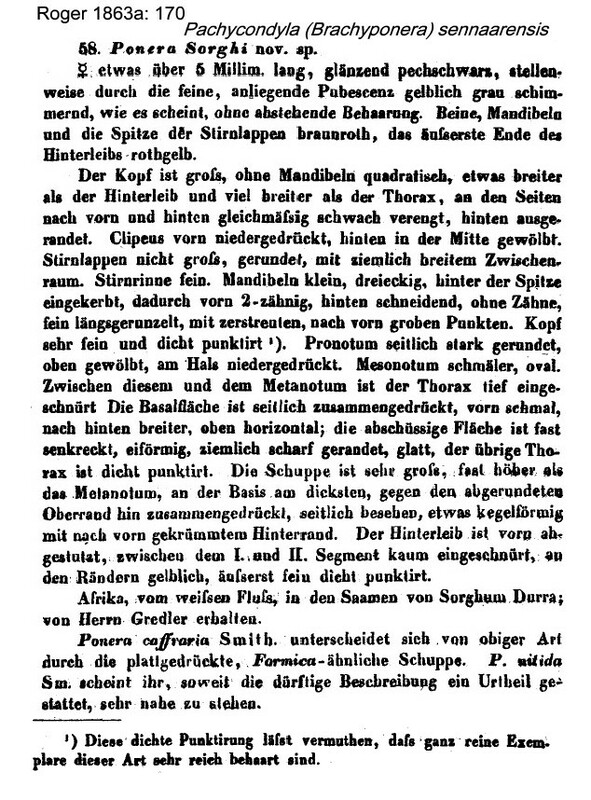 The listing of species within the, largely, revived genera, perhaps would be better based if Schmidt & Shattuck had listed the species actually examined by them. Their species lists also perhaps are confusing in listing subspecies but not synonyms. The lists give type location countries but not modern distributions. 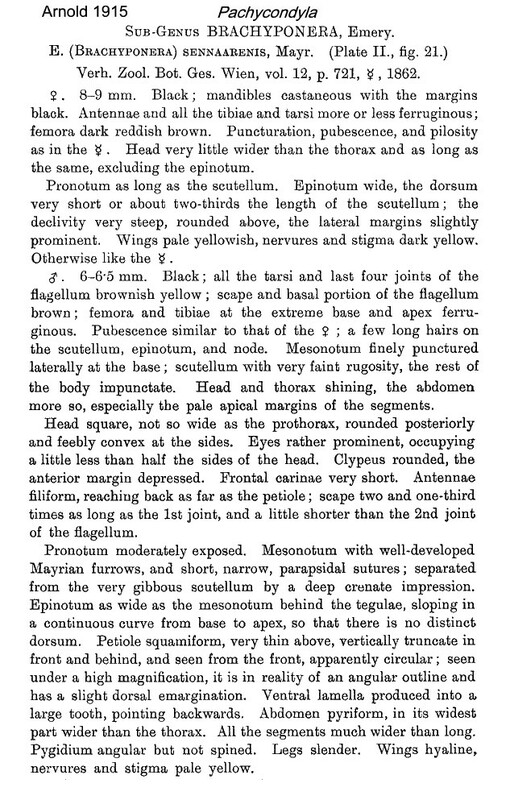 Mayr's (1862) description is at . 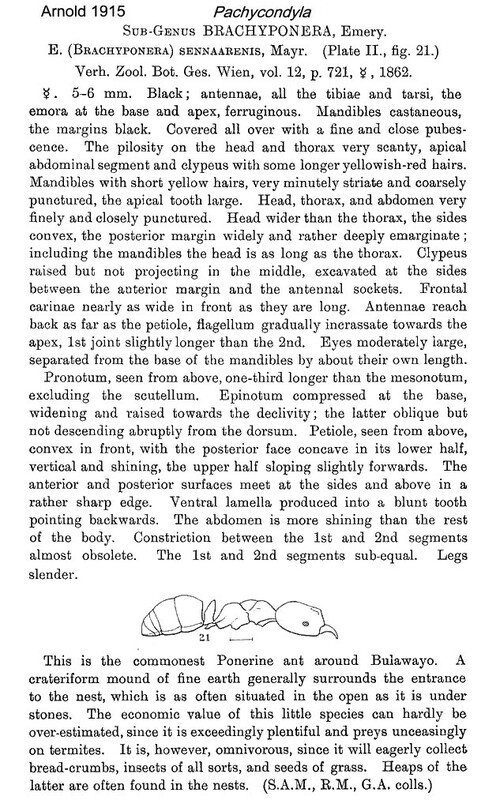 Roger's (1863a) description of sorghi is at . Arnold (1915: 72) gave a translation, this is at and, male & queen, . 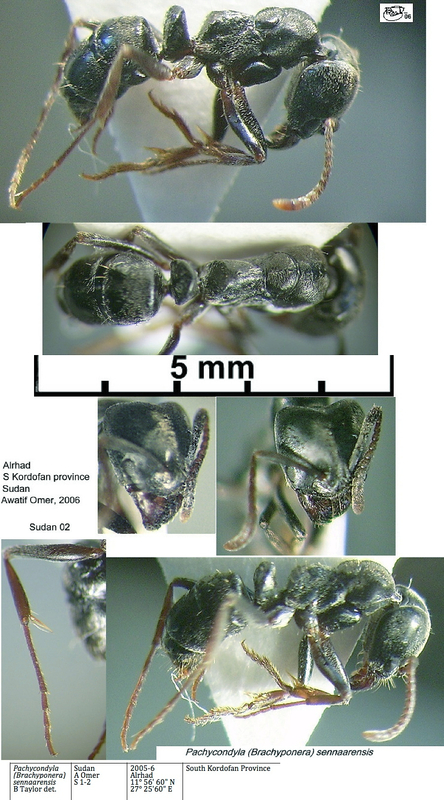 The photomontage of a syntype worker is collated from http://www.antweb.org/specimen.do?name=casent0902474. Specimen probably faded by age, as Mayr gave the original colour as predominantly black. 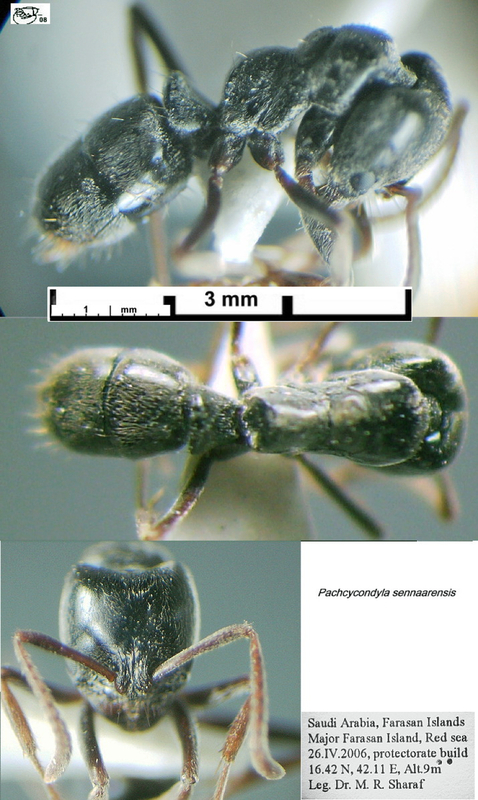 The photomontage of a syntype worker of sorghi is collated from http://www.antweb.org/specimen.do?name=focol0975. Egypt records - under junior synonym sorghi Roger - Donisthorpe (1942a), two males from Siwa & one from Maragi, collector J Omer-Cooper. The photomontage is of workers collected in Sudan by Awatif Omer, 2006, from Alrhad, South Kordofan province. Essentially a savannah species which penetrates adjoining forest zone areas. Nests directly into insolated soil, and forages on the soil surface. It was studied in some detail by Lévieux and Diomande, at Ferkéssédougou, Ivory Coast (Lévieux and Diomande, 1978). 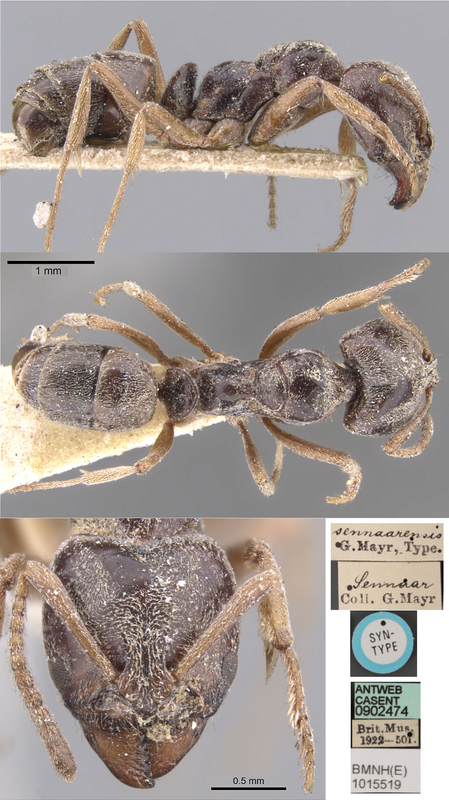 They described it as probably the most common ant in the Sudan savannah regions being found from Senegal right across sub-Saharan Africa to Somalia, and right up to the southern edge of the Sahara Desert at Tillabery in Niger, north of Niamey and alongside the Niger River. To the south they described its range as being brutally halted by the massif of the ebony forest. Its success was attributed to its granivorous diet. The nest opens on to the surface with a circular apertures, each 3-5 mm in diameter, around which is piled debris from the diet and nest excavations. Foraging openings some 2-3 mm in diameter, and perhaps 10 per m², permit access from underground galleries over a total area of up to 600 m². Dejean & Lachaud (1994), who studied the species in Zaïre, described it as unique among ponerines in being partially seed-eating, this being an adaptation to the dry areas which constitute its main habitat. In the wet season, and in wetter habitats, animal prey are the principal diet. In woodland areas, interestingly, the workers are noticeably smaller than those of savannah colonies. On balance they describe it as having a typically omnivorous diet, using every available food source, including fruit and higher animal remains where available, such as in the vicinity of human habitations. They listed earthworms, coleopteran larvae, lepidopteran larvae, termites and ants as the main prey. The photomontage is of a worker collected in Saudi Arabia by Mostafa Sharaf. Collingwood (1985, illustrated), reporting it from Saudi Arabia, described it as a robust, dark coloured species. He added that it is an agressive species, distributed throughout the African tropics, with Arabia probably its northern limit. It "feeds mainly on dead insects but is also attracted to sugary sunstances and food waste". The photomontage is of a worker collected in Qatar by Mostafa Sharaf.